Action feature: Code name: "Steel Jaw". Whips Its Snapping Jaws! 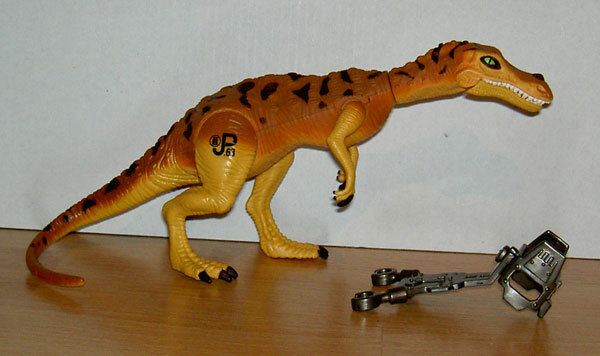 Description: this smaller dinosaur figure sports a lighter, earthy paint job, with predominant brown and yellow tones. A light brown colouring is found on its back, flanks, neck, head, upper part of the tail and the very upper part of the limbs. This brown gradually shifts to yellow, which is located on the underside of the creature (belly, throat, lower jaw, lower part of the tail) for the most part, as well as on the rest of the limbs. The figure carries black spots all over its back, neck and upper tail, and features what appears to be a small black horn on its snout, as well as black spots around his green eyes. The claws on both arms and legs are also black, and a black JP: Site B logo is seen on the right upper leg. The Baryonyx assumes a walking posture, with its left leg moved forward and its right leg backward. Its tail is bent towards its right leg, so this figure fits on its card. The figure is equipped with a whipping action: pulling the right leg back and forth makes the head spin around, as if the creature is thrashing its head. This also accommodates a dinosaur-breaks-free-of-restraint-gear action: when the capture gear is on, the Baryonyx can break free by thrashing its head. Additionally, the beast’s lower jaw snaps back when pulled down and released, making it possible for this sculpt to clasp other figures between its jaws, though the mouth can’t open really wide so most figures won’t fit. This Bary comes with two pieces of capture gear, which form a sort of harness around the creature’s upper body and restrain its arms and head. However, it wouldn’t stop the creature from running away. Both pieces are painted in a metallic dark grey colour. Analysis: this figure provides for a totally different take on the Baryonyx, a popular creature among dinosaur aficionados. The JPS2 Bary featured a totally different look: it was somewhat bigger and walked more upright. There are similarities though: both figures have a long snout for catching fish and a large claw on each hand. Both figures are bipedal with their tail towards the ground in a sort of tripod position with the legs, and they both have a tendency to fall down because the front part of the body is heavier than the back. And unfortunately neither of them are very successful figures. The main concern with this particular Bary is the attack action. It’s virtually identical to the action the Ornithosuchus from this same TLWS2 toy line features, and since these two creatures are the only new dinosaur figures of this line (excluding the hatchlings that is), this attack action lacks originality (I blame the Bary for this because Ornitho was planned to be released in the JPS2 toy line but never made it to stores until the TLWS2 line was released, making Ornitho the more original figure of the two). Baryonyx can thrash its head around by pulling on its right leg. It looked cool on the Ornithosuchus, since it had large jaws capable of gripping other figures, but it doesn’t work on this Bary because its mouth is too small to grab most figures. Basically, Bary looks silly when whipping its head. And like with the Ornithosuchus, it doesn’t snap its jaws on its own, you have to do it by hand, so there’s no improvement of this action feature either. However, unlike the Ornithosuchus, the thrashing action combined with the capture gear does provide for a dinosaur-breaks-free-of-restraint-gear action option. It actually works quite well, and redeems the otherwise lousy whipping head feature to some extent. It’s a shame the figure doesn’t come with capture gear to restrain its legs though, seems a bit illogical. 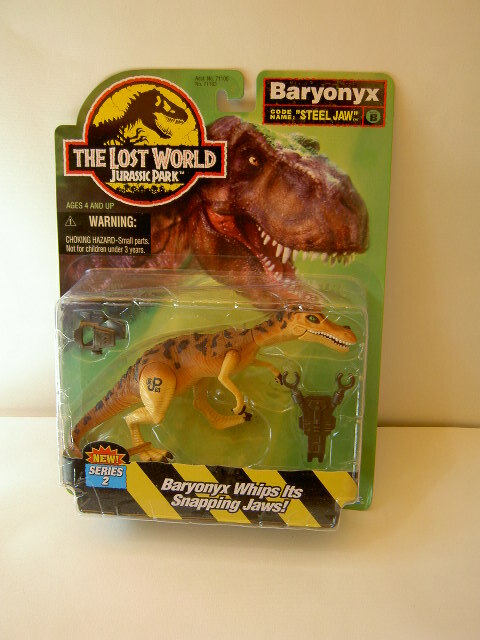 This Baryonyx sculpt also isn’t a great design. It’s head sculpt is pretty ugly, and it often falls down because it’s too heavy on the front and its legs are positioned at the end of the body. Also, the tail gets in the way of activating the action feature because it’s bend in such a way the figure can fit on its card, which otherwise wouldn’t be the case. It would have been preferable if the attack action could be activated by moving the other leg instead. The paint job of this Baryonyx is decent enough, though the yellow is a bit ugly and could have used more detailing. And the dark-spots-on-creature’s-back pattern has been done before (and would be done again). So overall, this creature could have used a more appealing design. Playability: relatively high. This dinosaur features a total of six poseable body parts, namely the arms, legs, head and lower jaw. However, the right leg and the head support the snapping action and swing right back when moved, as does the jaw. This diminishes playability options somewhat. The two pieces of capture gear add something however, especially since they can also be used in a dinosaur-breaks-free-of-restraints action. The tail can get in the way at times, since it’s bent in such a way to accommodate the way this figure is packaged. However, with loose Baryonyxes the tail usually bends back over time. Realism: this figure is certainly reminiscent of a real life Baryonyx (or at least the way palaeontologists think it looked like), due to its crocodilian head sculpt and a single large claw on each hand. It’s not totally realistic though: the claws on the hands are a bit small, the animal itself is quite skinny and it’s unlikely this particular Bary could walk on all fours, like most scientists believe Baryonyx was capable of. Also, the head sculpt isn’t totally accurate, and compared to human figures this Bary is on the small side (Bary’s could grow twice as big). 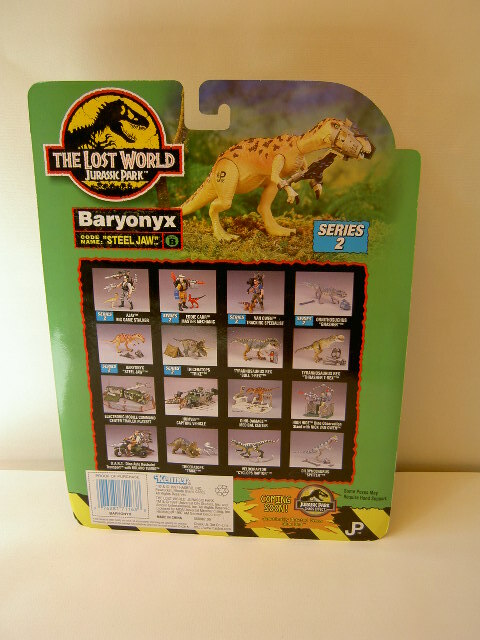 Baryonyx has not been featured in any of the JP movies, TLW or otherwise. It has been rumoured Baryonyx originally was going to get a role in JP III, but the producers opted for Spinosaurus instead. Repaint: no. 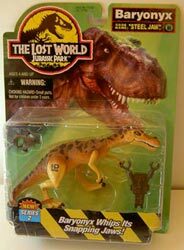 However, this figure would be repainted twice for the first JP Dinosaurs line, once on its own, and again in a 2-pack with a human figure (Baryonyx with Dinosaur Tracker). In both cases it would come with the same capture gear as this figure, though repainted. It was also planned to be repainted for the JP Chaos Effect: Night Hunter Series line, but that entire line was scrapped. Overall rating: 5/10. It’s not the best TLW figure, sporting a bit of a lousy paint job and unoriginal action feature. It has some positive aspects, but is overall disappointing Unfortunately, it’s also relatively rare and usually fetches higher prices. If you don’t care much for it, don’t bother.